Most people that read about or practice the esoteric arts will know that all new ritual tools need to be consecrated before use. When a ritual tool is consecrated, I am bringing them before the higher Divine powers that be as a sign of respect, for their approval and blessing. Not only this, but having the ritual tool consecrated charges and activates the tool so that it is ready for esoteric practice. When I consecrate a ritual tool, I am calling on certain forces of intelligence`s from other realms to help with is process. 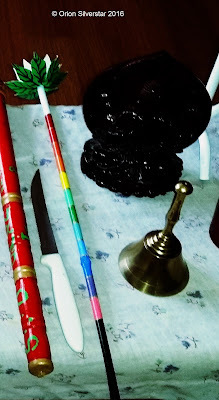 As I make my own ritual tools, which I encourage everyone to do if it is possible. I am putting my personal energy into the ritual tool, through not just the making of it, but also the thoughts of what it is going to be used for while doing this. I visualize myself in ritual with this tool in action. All this helps to personally charge the ritual tool in itself, however more is also needed as explained above. So here in this article I am going to explain the ritual I used to consecrate my Lotus Wand/Rainbow Wand. This ritual is for someone more experienced and trained in this tradition of Ceremonial/High Magick. 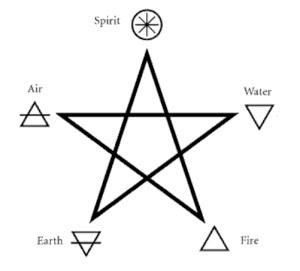 Firstly, a lot of the main rituals that are used in nearly all of my ceremonies, for example, "The Lesser Banishing/Invoking Ritual Of The Pentagram, The Banishing/Invoking Ritual Of The Hexagram, The Middle Pillar Meditation, The Kabbalistic Cross Meditation, The Supreme Invoking/Banishing Ritual Of The Pentagram, The Opening By Watchtower Ritual and more, I have written in one of my magickal work books for quick reference. However, after a few months of performing these opening and closing rituals, it is important to commit them to your memory as I myself have. This way you are then able to more closely focus on your visualization skills and vibration of certain "Words Of Power" more clearly. What is a "Word Of Power" you may ask? A "Word Of Power" is often a Divine God/dess name, Angelic name, Deity name, Entity name, E.T name, Jinn name, Daemon name and more. However, these names are vibrated through sound and voice on a very precise frequency. Combined with the use of different ancient languages like, Hebrew, Latin, Seminarian, Aborigine and more. When these "Words Of Power" are vibrated right then they will draw to you the attention of the very beings in which you are vibrating as well as other intelligence's from other realms. The Lotus Wand has 12 colours, each of these colours represent the 12 signs of the Zodiac. There is other correspondences in relation to the 12 signs of the Zodiac. To mention some examples are, the 12 Months of the Year, the 12 Disciples of The Christ, the 12 Spokes in Ezekiel`s Wheels, Robyn Hood`s 12 Merry Men, 12 Tribes Of Israel and more. In this Consecration Of The Lotus Wand ritual, the Angels, Gods and the Elemental and Zodiac forces will be invoked and acknowledged for all 12 signs, one at a time. Also included in each Zodiac dedication will be their Elemental Invocation Pentagram, as each Zodiac sign falls under an Elemental force. For Banishing you draw away from the elemental point in one continuous line, forming a Pentagram. 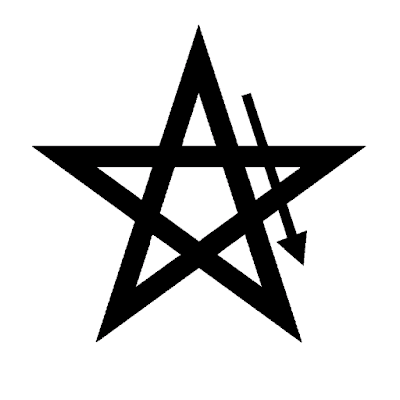 For Invoking you draw towards the elemental point in one continuous line forming a Pentagram. Banishing and Invoking elemental Pentagrams, Spirit Active and Passive Invoking and Banishing Pentagrams. The Consecration Of The Lotus Wand is a one time ritual. Also given the fact that, through the ritual I would be going through each Zodiac Invocation and dedication one at a time and one after the other. I knew that is main part of the ritual did not have to be committed to memory, and so I decided to write all 12 Invocations down on a piece of cardboard separated from the the rest of the ritual which was written in one of my Books Of Shadows. This made things a lot easier for me to go through each card in order, one at a time, it worked well. As I mentioned above the importance of Visualization, Focus and word Vibrations. Even though this part of the ritual does not need to be memorized and is read from 12 cards. Some preparation is needed, it is important to go through the whole ritual and what is written on the cards before hand, like say, one week before the ritual, reading through it every day. Practice Vibrating the Words Of Power, read through what is on the cards slowly and with feeling and meaning. Practice tracing the Invoking Elemental Pentagrams and Visualizing their colours. The Angels that are mentioned for each Zodiac, look them up on the net and learn all about them prior to doing the ritual. 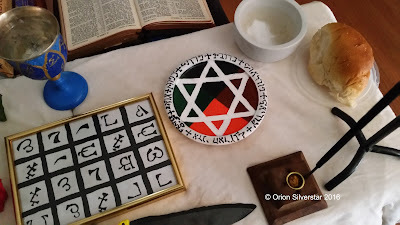 The Hebrew words of power, learn all there is to know about them and the Hebrew letters which are Magick symbols in themselves, that make up the word. One thing also that is good to commit to memory, if you wish to practice this tradition of Magick, is the Hebrew Alphabet. Something else you really need to commit to memory is all the Pentagrams, Invoking and Banishing, Elemental, Spirit and Planetary, this also go`s for the Hexagrams as well. Rather than using the Planetary Hexagrams, I use the unicursal Hexagrams, as it draws one continuous line. Just like the Pentagrams, start where the Planet symbol is and draw the line away from it for Banishing, and towards the Planet symbol for Invoking. So the Solar/Sun Banishing Hexagram will start in the middle and the drawn line will move away from the Solar Symbol. 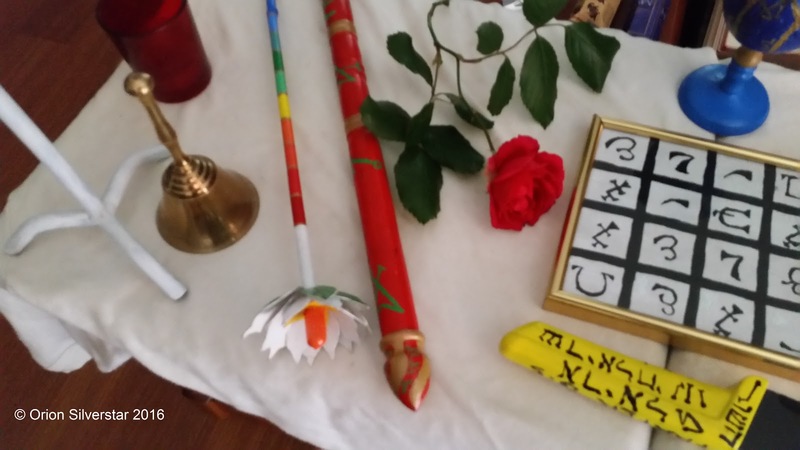 When doing this Consecration Of The Lotus Wand Ceremony, you will be standing in the Magick Circle, at the position of where the Zodiac sign you are doing the Invocation is stationed. Aries is at 12 O`Clock, Taurus is at 1 O`Clock, Gemini is at 2 O`Clock, Cancer is at 3 O` Clock, Leo is at 4 O` Clock, Virgo is at 5 O` Clock, Libra is at 6 O`Clock, Scorpio is at 7 O` Clock, Sagittarius is at 8 O` Clock, Capricorn is at 9 O` Clock, Aquarius is at 10 O` Clock and Pisces is at 11 O`Clock. As I mentioned above, there will be 12 Invocations of the Zodiac to go through. These 12 Invocations feature Angels, Divine Names Of Power and Tribes of Israel that are directly related to the Zodiac sign they represent. These are the powerful forces at work with each Zodiac and Element connected to it. Here is the Angels, Tribes Of Israel and Divine Names, to be invoked under each Zodiac. Aries - Divine Name : Yud-Heh-Vahv-Heh, Hebrew Letter : Heh (draw this letter in Hebrew in the air), Tribe Of Israel : Gad, Angel : Melchidael. Taurus - Divine Name : Yud-Heh-Heh-Vahv, Hebrew Letter : Vau (draw this letter in Hebrew in the air), Tribe Of Israel : Ephraim, Angel : Asmodel. Gemini - Divine Name : Yud-Vahv-Heh-Heh, Hebrew Letter : Zayin (draw this letter in Hebrew, in the air), Tribe Of Israel : Manasseh, Angel : Ambriel. Cancer - Divine Name : Heh-Vahv-Heh-Yud, Hebrew Letter : Cheth (draw this letter in Hebrew, in the air), Tribe Of Israel : Issachar, Angel : Muriel. Leo - Divine Name : Heh-Vahv-Yud-Heh, Hebrew Letter : Teth (draw this letter in Hebrew, in the air), Tribe Of Israel : Judah, Angel : Verchiel. Virgo - Divine Name : Heh-Heh-Vahv-Yod, Hebrew Letter : Yod (draw this letter in Hebrew in the air), Tribe Of Israel : Naphthail, Angel : Hamaliel. Libra - Divine Name : Vahv-Heh-Yud-Heh, Hebrew Letter : Lahmed (draw this letter in Hebrew in the air), Tribe Of Israel : Asshur : Angel : Zuriel. Scorpio - Divine Name : Vahv-Heh-Heh-Yud, Hebrew Letter : Nun (draw this letter in Hebrew in the air), Tribe of Israel : Dan, Angel : Barchiel. Capricorn - Divine Name : Heh-Yud-Heh-Vahv, Hebrew Letter : Eye-In (draw this letter in Hebrew in the air), Tribe Of Israel : Zepulun, Angel : Hanael. Aquarius - Divine Name : Heh-Yud-Vahv-Heh, Hebrew Letter : Tzaddi (draw this letter in Hebrew in the air), Tribe Of Israel : Reuben, Angel : Cambriel. Pisces - Divine Name : Heh-Heh-Yud-Vahv, Hebrew Letter : Koph (draw this letter in Hebrew in the air), Tribe Of Israel : Simeon, Angel : Amunitziel. Here is the 12 O`Clock Aries card example, it is important to note that all of the words of the 12 Zodiac invocations are the same. The only changes are the Divine names, the Angels, the Tribes Of Israel and the Hebrew letter. The heavens are above and the earth is beneath. Between the light and the dark do vibrate the colours of life. 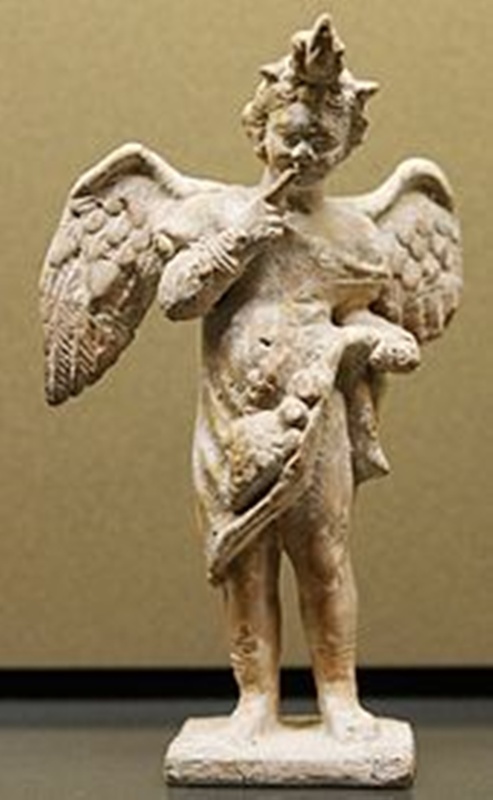 I supplicate the powers and forces governing the nature, place, and authority of the sign of Aries by the majesty of the Divine name Yud-Heh-Vahv-Heh with which, in earth life and language. I ascribe the letter Heh to which is allotted the symbolic tribe of Gad. Over which is the Angel Melchidael to bestow this present day and hour and confirm their mystic and potent influence upon the Red band of this Lotus Wand which I hereby dedicate to purity and esoteric work. May my grasp upon it strengthen me in the work of the nature and attributes of Aries. Another thing that will need to be placed on each card is the Elemental Invoking Pentagrams of each Zodiac signs, and the symbol of each Zodiac. So the Invocation Pentagram for Aries would be the Fire Elemental Invocation Pentagram and so on. 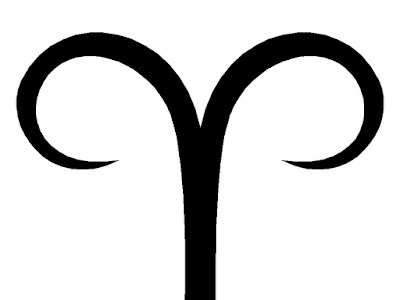 Aries symbol to also be traced, I will leave you to work out all the other Elemental Invocation Pentagrams for each Zodiac Sign. Another thing that is very important when doing all 12 invocation, dedications. The right coloured band is held in relation to the Zodiac sign card you are using. To learn more about this, see another one of my blogs relating to the Lotus Wand. As each coloured band, in all 12, on the Lotus Wand represents different Zodiac signs. Here are the 12 colours on the Lotus Wand which relate to the 12 signs of the Zodiac. They will be in order in relation to how they are placed on the Lotus Wand from top to bottom. The Zodiac sign colours should be memorized as the Lotus Wand is used for a lot of workings of Magick within this tradition. Another ritual that is used in this ceremony, is called "The Opening By Watchtower Ritual. As I have said, this ceremony is for those that are more advanced in Magick, in relation to this tradition. I have not written an article of yet about the The Opening By Watchtower Ritual, however I hope to do so in the not to distant future. The Opening By Watchtower Ritual is just as it says, it is a very powerful opening and invocation ritual for the ceremony been conducted. Other than the regular ceremonial tools, that being the elemental tools, candles, incense, maybe the Cross and Triangle or the Tablet Of Union, Male and Female Deities on the altar. You will also need some salt on the altar, unless you have already made up some Holy Water, you can see how to do this at one of my other blogs. 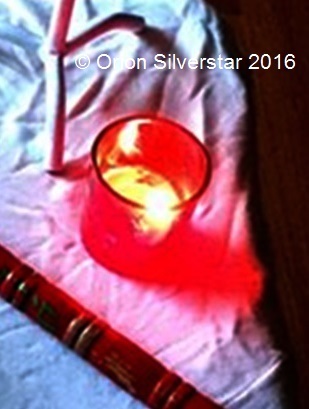 You will also need a Red Rose on the altar, plus a Red Lamp which can be a red candle upon the altar. Start behind your altar, facing East. Pick up the Lotus Wand, holding it by the Black band, move to the East Watchtower and perform the Lesser Banishing Ritual Of The Pentagram, going to all 4 Watchtowers ( you can find how to do this at one of my other blogs). Once back behind your altar, take the Lotus Wand by the White band, then move to the East Watchtower to perform the Banishing Ritual Of The Hexagram, going to all 4 Watchtowers. Now once behind your altar again, place the Lotus Wand back on the altar so the top of the wand is facing towards the East. Light your Incense with the Red Lamp, the incense I most often use for ceremonies like this, is Frankincense or Myrrh, sometimes White Sage or Sandalwood. O Harpocrates, Lord Of Silence who art enthroned upon the Lotus Flower, O Lord Of Creation for the Lotus petals present your Mighty Divine name, in the name of YHVA = Yod-Heh-Vah-Heh (vibrate name). Now do the Opening By Watchtower Ritual. Through this ritual, when it calls for the use of the elemental tools, you will be holding the Lotus Wand in your Right Hand by the White band and the elemental tool in the Left hand. Once the Opening By Watchtower ritual is done, then perform the Kabbalistic Cross exercise. Now perform the Middle Pillar exercise. 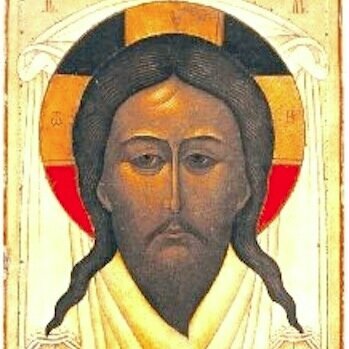 In that hour when the Son Of Man is invoked before the Lord Of Spirits and his name before the Ancient Of Days. The Heaven is above and the Earth is below. Between the Light and the Darkness the colours vibrate. Now start the invocation/dedication/consecration ritual of the Lotus Wand, which was explained above. 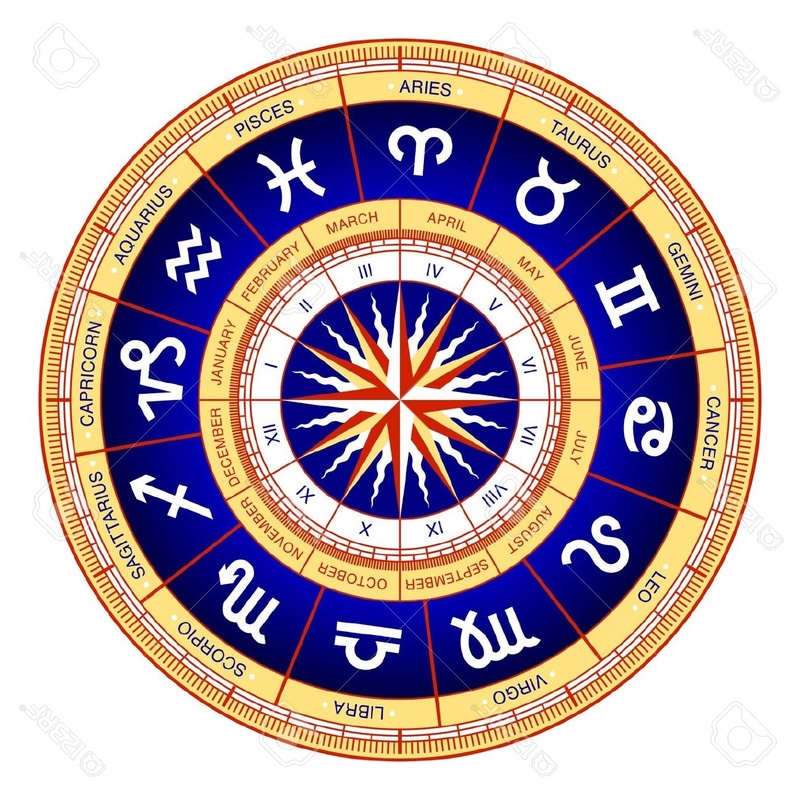 Going around the full circle, starting at 12 O`Clock in Aries, holding the Lotus Wand by the right colour, reading from each of the 12 cards as you go. Read it slowly and with meaning in your voice, and vibrating the Divine names, Angels and Tribe names. At the end of the reading of each card perform the Invoking Pentagram of the Zodiac sign of that card. Trace the Pentagram with a circle around it in a clockwise direction, then trace the symbol that represents the Zodiac sign in the middle of the traced Pentagram. Wait about a minute before moving onto the next position on the circle. Try to feel the energy of the powers you just called upon, if you did not feel anything, that does not mean it did not work. It might mean that you are not yet sensitive enough to feel their presence. While moving around the circle or using the Lotus Wand, be very careful not to let the top part of the wand, the Lotus Flower to point downwards ever. Once all 12 invocations of the Zodiac have been completed, move back to behind the altar, facing East and return the Lotus Wand to the altar also. 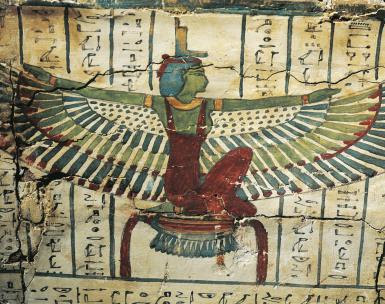 O Isis, Great Goddess of the forces of nature. Let thine influence descend and consecrate this lotus Wand which I dedicate to thee for the performance of the works of Magick of Light. Now take up the Salt and put some in the Cup of Water, with the cup, walk around the circle in a clockwise direction starting from East, sprinkling the Water as you go. Replace the Cup on the altar, then take up the incense and move around the circle with the incense. Once back at the altar facing East, go around the circle in a anti-clockwise direction, while holding the Lotus Wand by the White band. Visualize the energies empowering your Lotus Wand and also yourself. Hold the Lotus Wand up high as you go, move around the circle in this direction three times, then return to the altar facing East. In the name of Yeheshuah (The Christ) I now set the spirits free that may have been imprisoned by this ceremonial working. Now perform the Lesser Banishing Ritual Of The Pentagram, using your Lotus Wand and holding it by the Black band. Then perform the Banishing Ritual Of The Hexagram with your Lotus Wand, while holding it by the White band. Yeh-Hah-Shu-Au (The Christ) and Yeh-Hoh-Vah-Sha (Jehovah). I now declare the Temple/Circle closed. Thanks for showing an interest in this blog of mine. If you have any questions in relation to this article, please feel free to leave me a message ether here or at my Google + page under the posting of this video. Limitless Light ! !